In Java the physical and logical architecture models are almost identical since the package structure is reflected in the physical layout of a project. The only difference occurs when a Java file contains more than one top level type. In that case there would be one component for every top level type in the logical model, while there would be only one component for the Java file in our traditional physical model. Therefore the logical model is much more suitable for languages like C# and C++ where there is no enforced relation between namespaces and the physical location of source files. The following example from a real C++ project should explain the difference. The open source project “POCO” is organized in several modules. Each module has a single source root directory and one root directory for public include files. All C++ source files of that project are flat in the source root directory. C++ namespaces are used but not reflected in the physical organization of the project. 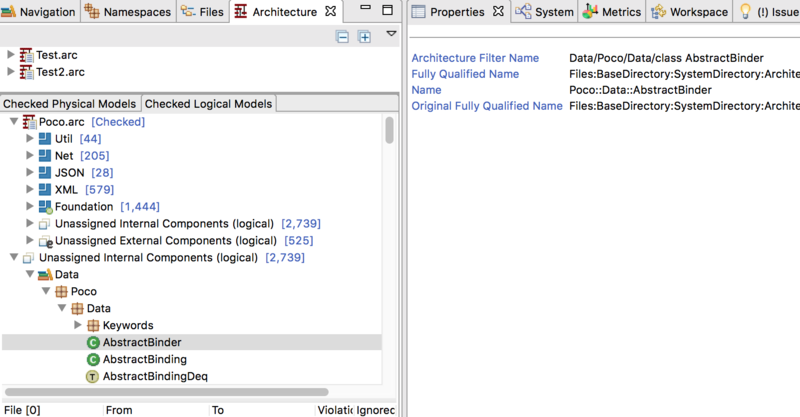 As you can see in the “Properties View” on the right the architecture filter name of the component “AbstractBinder” is “Data/AbstractBinder”, i.e. the module name followed by the name of the component. There is nothing in between because the component is directly located in a source root directory. Now the filter name is “Data/Poco/Data/class Abstract Binder”. Between the module name and the component name we have the namespace of the class. This enables you to base the architectural assignment of the component on its namespace name. or omit the model statement completely. As always please leave questions or comments below.